I’d have to say I’m a guy who likes variety in my hiking adventures. My hiking to-do list has many flavors, and I’m not one to get stuck on vanilla. 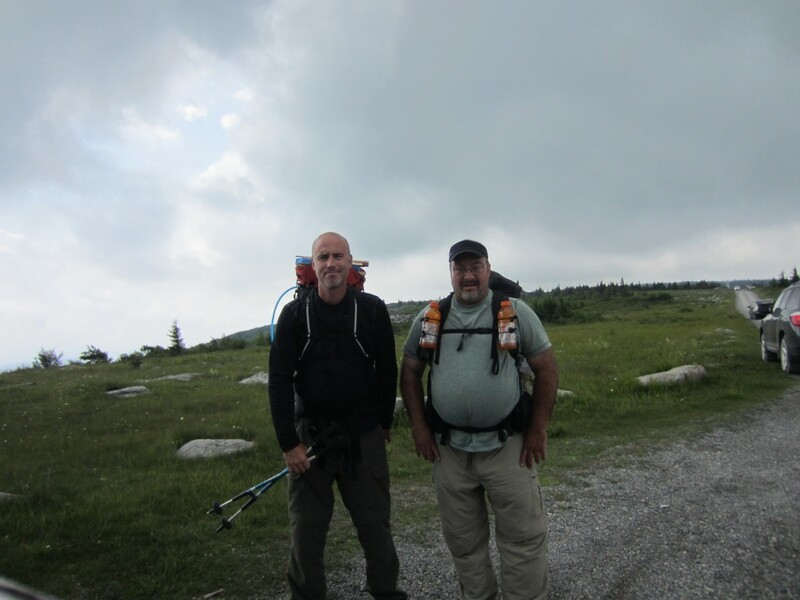 That’s why I was a little surprised that me and the boys wound up back in “Almost Heaven West Virginia” and the Dolly Sods Wilderness so soon. Actually, it should come as no surprise to anyone who’s ever visited the “sods”, since there are so many different types of terrain in one tidy package. Joining Matt and me on our return visit would be Matt’s son Matt, as well as Paul Cummings, Dave Darrow, and his son Noah. During the trip planning phase Matt and I kicked around a few ideas of how we envisioned the hike. 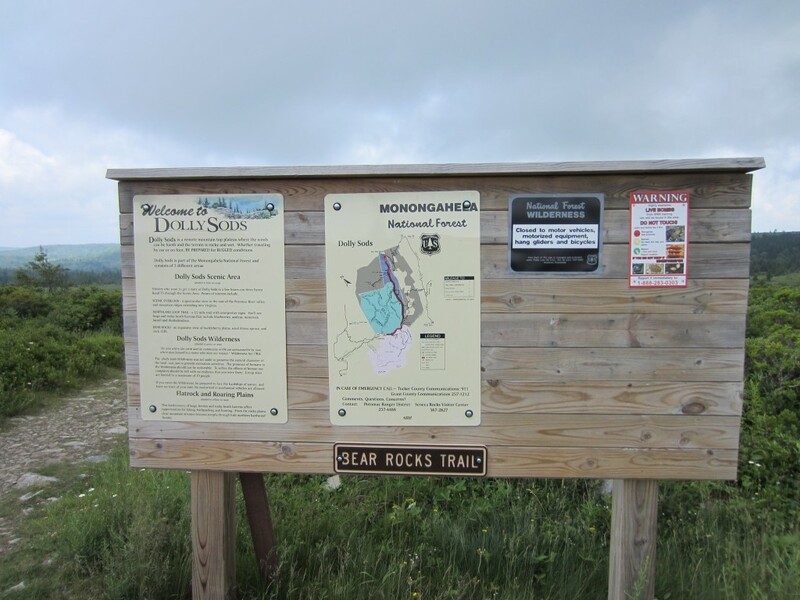 My hike started at Bear Rocks trailhead at the top of Dolly Sods, while Matt’s originated at the Red Creek trailhead in the lower end of the wilderness. The only thing we had to take into account was the fact that Dave and Noah were hiking in and joining us at our camp on the second afternoon, and it made for some interesting ideas. In the end we all agreed that Red Creek was the best choice. An early start and many miles later and we were turning onto Forest Road 19. 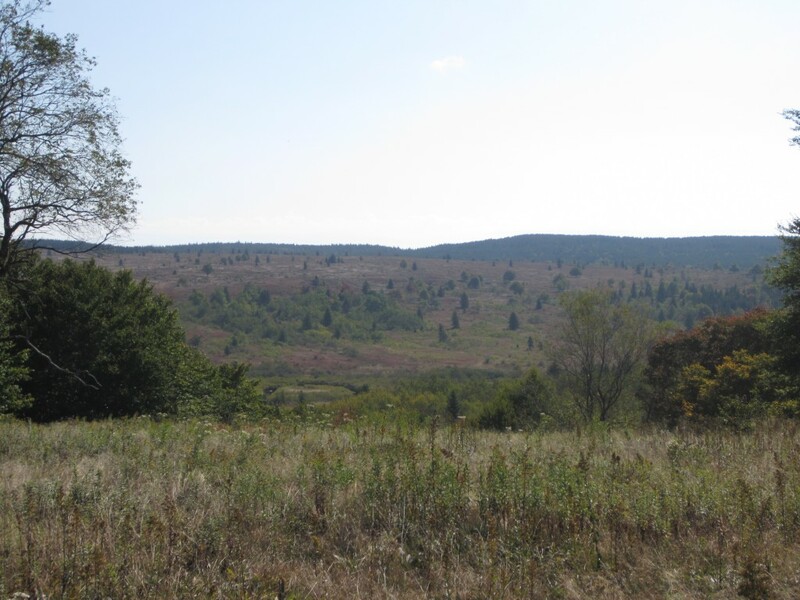 As we traveled toward the Red Creek trailhead, FR19 started a rather long descent and it became apparent that we were beginning in the lower valley as opposed to the plateau that Dolly Sods North is known for. My only hope was for nice grades as we regained any lost altitude while on the trail. One continuing theme in this wilderness area is the lack of trail markers other than junction signs, and other than a few confusing areas early on, the trail was relatively easy to follow, with a nice, steady, moderate grade. It started along Red Creek and would climb in a side slab fashion along the hillside before dropping to meet the creek for a crossing, before once again repeating on another hillside. We stopped at a high point to eat lunch, and this is where I must confess my ultra light backpacking sin – I brought a frying pan! Actually not just a frying pan but an MSR Flex Skillet, weighing in at 6.7 ounces. What’s the big deal you say? Well, for someone like me who has spent years trimming his load and whittling away at non essentials this is unheard of. I decided that I would eat like a king this trip and see if I could shake my fear of extra gear. On the lunch menu was trail pizza, which consisted of two pita halves stuffed with pepperoni, sauce and mozzarella, and then toasted in the pan. Quick, delicious, and worth the trouble, I’ll rate that meal an A! Our destination for the day was the same camp that Matt and I had stayed at on the last trip, along the left branch of Upper Red Creek. That changed the moment we hit Three Forks. Plenty of beautiful places to hang, and hardly a soul around convinced us we were home for the night. All I can say is this is my favorite spot to camp in the ‘Sods, with everything a backpacker would want in a temporary home. 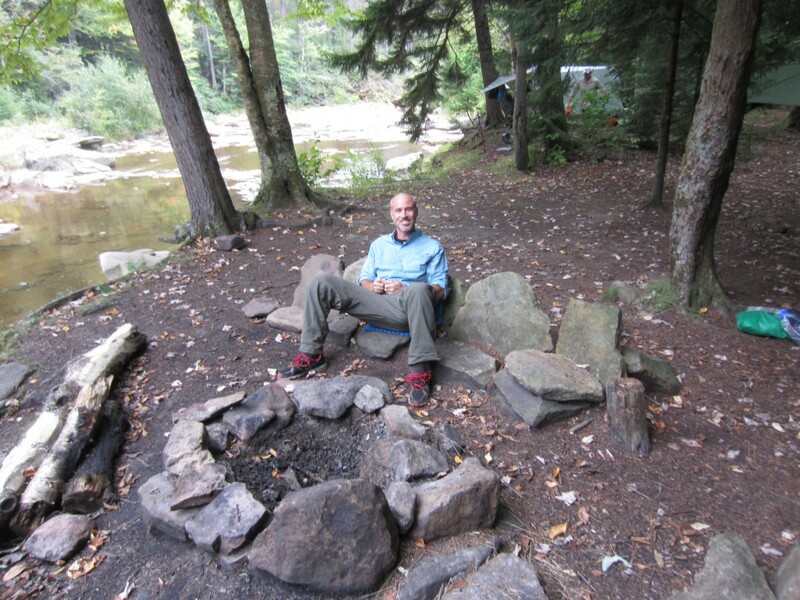 There are plenty of spots for hangers and non hangers alike without crowding anyone out, a couple of nice creeks, and someone actually took the time to construct Adirondack type stone seats around most of the fire pits. 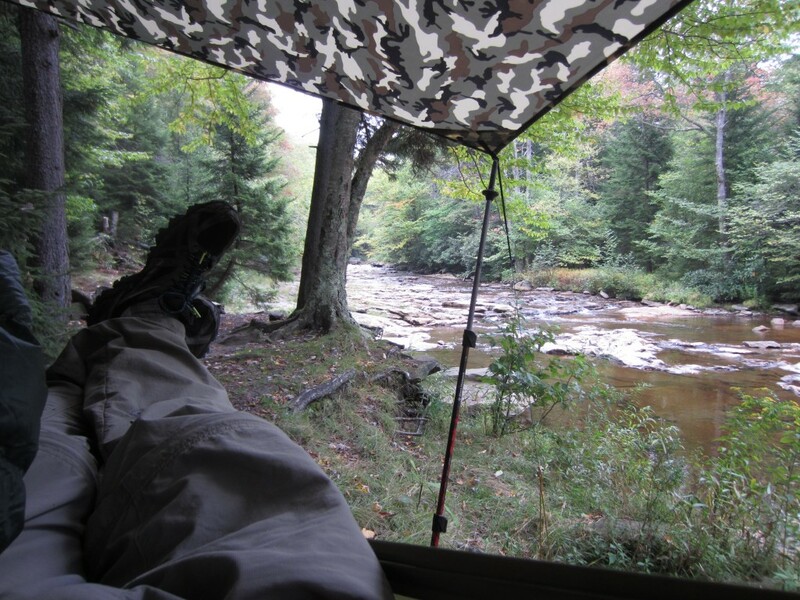 Don’t be confused – this is no campground, but back country camping at it’s best. After making camp and gathering firewood the next order of business was dinner. I told the guys I was bringing steak, but I think they thought I was kidding. If I was carrying a skillet I wanted a steak that was going to fill it, and I think I succeeded in the form of a 16 ounce thick cut NY Sirloin. As it sizzled away the smell wafted throughout the entire area. Thankfully it was bear season or I would have been concerned about visitors. I’ll call meal #2 a success, and something worth repeating. After dinner Paul and Matt stoked the fire, and I shared from Psalm 51, which has become something of a regular bedtime read for me as of late. I make it my prayer to ask for God’s mercy and to ask Him to “create in me a clean heart” before I sleep. What a great nights sleep! The only thing that could have been better would have been a clear night for star watching. No matter, the mid 50’s temperatures were just the ticket for a work weary body, and looking out from the warmth of my nest the view made it clear that this would be a great day in the wilderness. Up and at ’em, chocolate chip pancakes and let’s pack it up and go! his mercies never come to an end; they are new every morning”. What a promise! Everyone was excited for what the day held in store. 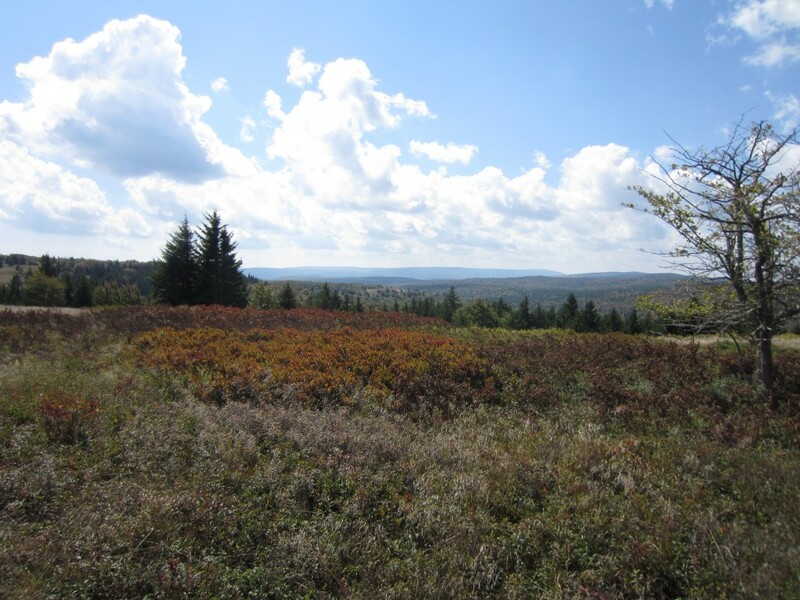 We would be climbing to the northern end of Dolly Sods, with it’s high plains and open views. 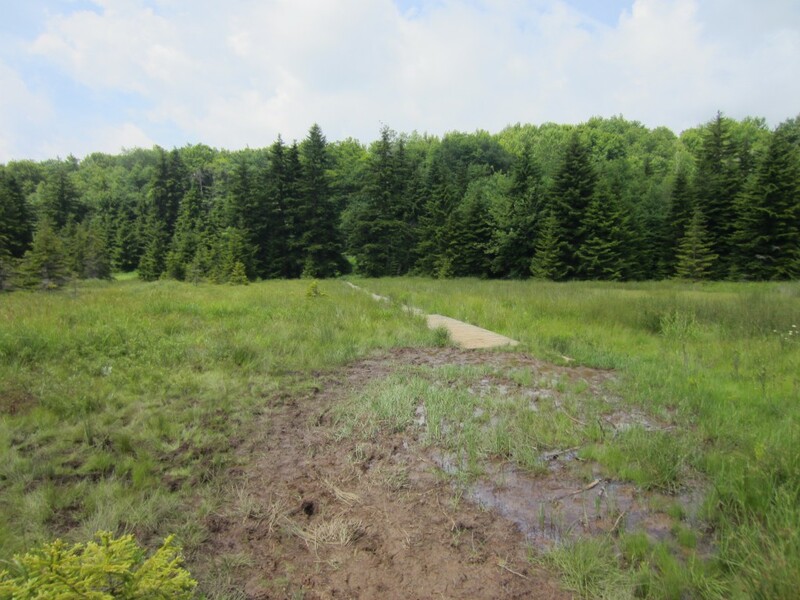 As we climbed the Red Creek Trail toward Blackbird Knob we could hear the sound of dogs running a bear not too far from our position, and I wouldn’t have been surprised if we had seen a bear run across our path. As the dogs excited barks eventually faded we were once again left alone with just the sounds of the forest. No matter, as we gained altitude the forest opened and there were more and more fields and views to take in. We stopped for a quick snack at the intersection of the Dobbins Grade Trail and the plan was to ascent via the Raven Ridge trail a short distance away. Only one hitch in that plan – Matt had the only map and I didn’t bother to take a look during the break, so we wound up turning left onto Dobbins Grade instead of right. No matter, I like an adventure, right? Anyhow, we drudged along on a lightly used and slightly boggy section of Dobbins Grade, until at last we came upon the Beaver View trail before realizing my mistake. It’s all good, as my pastor likes to say, we’ll just take that trail instead. After 1.2 miles we intersected the Raven Ridge trail and were back on course. Back on familiar terrain we happily hiked along taking in the views. What an awesome day to be walking in the wilderness – sunny, a slight breeze in the air, beautiful scenery and perfect temperatures. It don’t get much better folks! 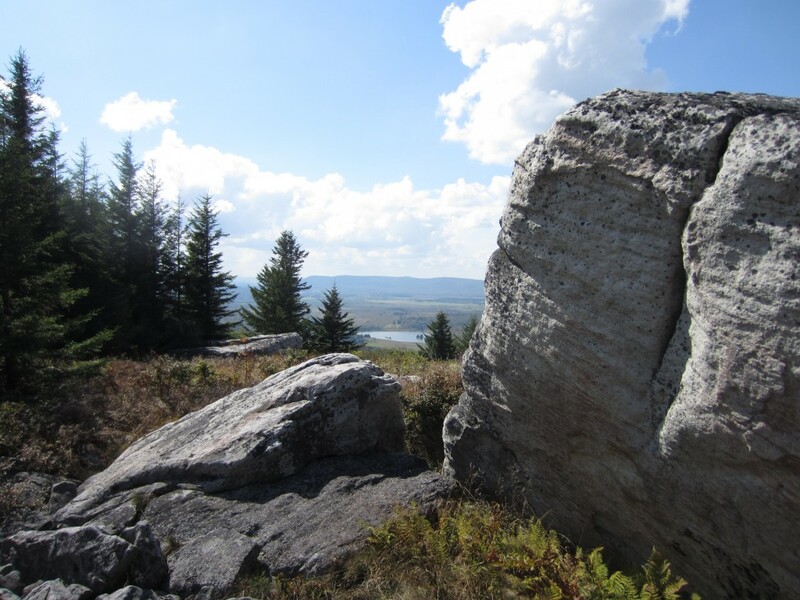 Once we reached the Rocky Ridge trail we looked for a rock with a view to enjoy our lunch from. Everyone kicked back, took off their shoes, and took it all in. Lunchtime view from the Rocky Ridge Trail. Back on the trail we were now on a course back to the valley, and over the next several miles we would pass over a number of knobs and rocky features before finally diving down to Stonecoal Creek. Along the way we passed a couple on horseback, and while I like riding I would rather be walking this rocky stretch of trail. As we started down the Big Stonecoal Trail our destination was the second crossing of Stonecoal Creek. 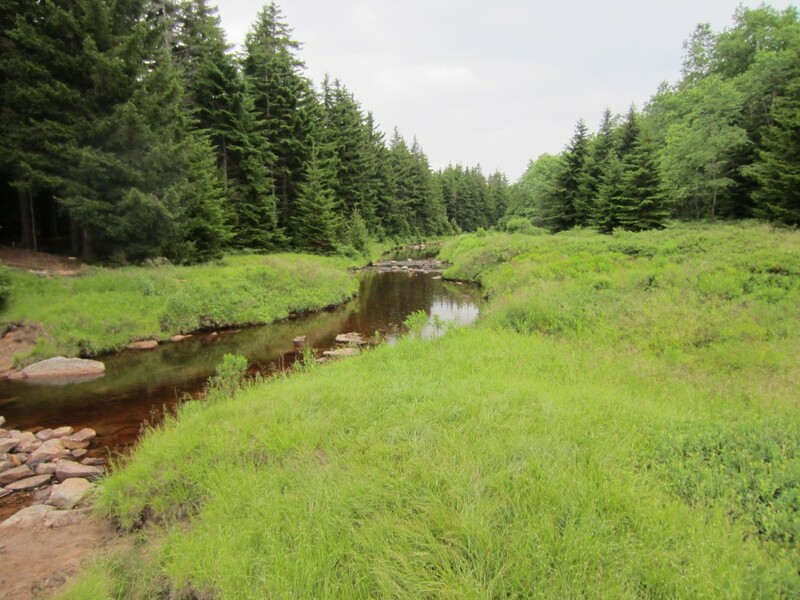 It had been described by one author as “the most beautiful campsite in the entire Dolly Sods Wilderness”, with the promise of a nice sand beach and plenty of campsites. I must admit, after our camp at Three Forks the night before I had pretty high expectations. We hit the first crossing and Stonecoal Creek was barely a trickle, not the mighty creek I had expected. When we hit the second crossing we all had our doubts as to whether this was the spot we were looking for, so much so that Matt and his son dropped their packs and hiked on to the next trail junction just to verify our position. We were there all right, but what a letdown. 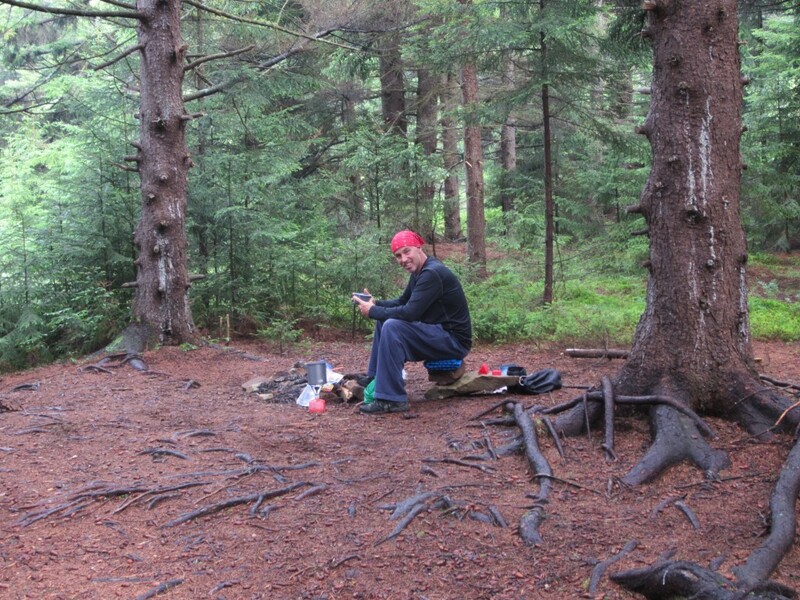 I will admit that the campsite grew on as as we made it our home, but we had such high hopes. There were few decent spots to hang and the beach we were promised wouldn’t have normally even garnered a look if we weren’t told about it ahead of time. No worries, we were still just happy to be outdoors. 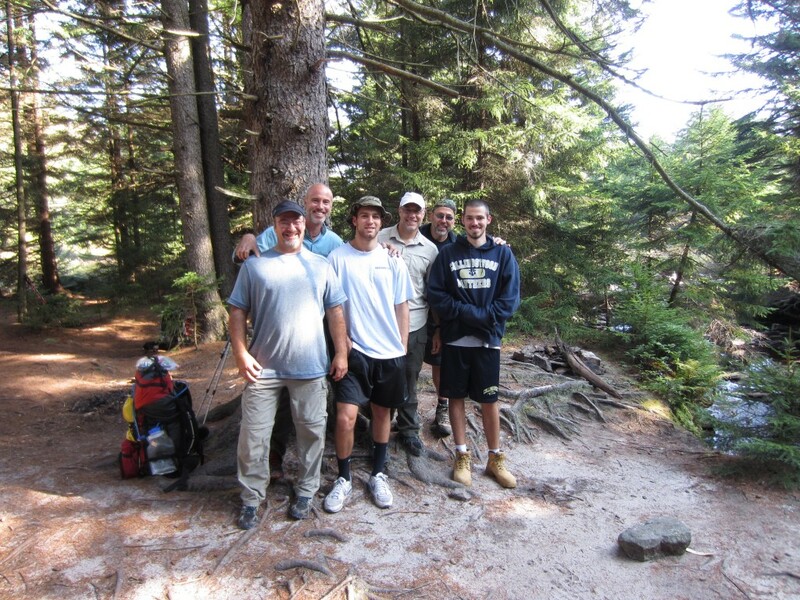 Our biggest concern at this point was the fact that Dave and Noah hadn’t made it to camp. It was after 4 pm and I thought they would have been there by now. Knowing there was no way to verify that they even made the trip from New Jersey, we set about the business of setting up camp. Around 5 pm I noticed a hiker coming down the trail and realized it was Noah. They made it! Dave said he had a frustrating time with some of the trail junctions, and apparently there more than a few folks having the same troubles. Somehow he had sorted it all out and found us. 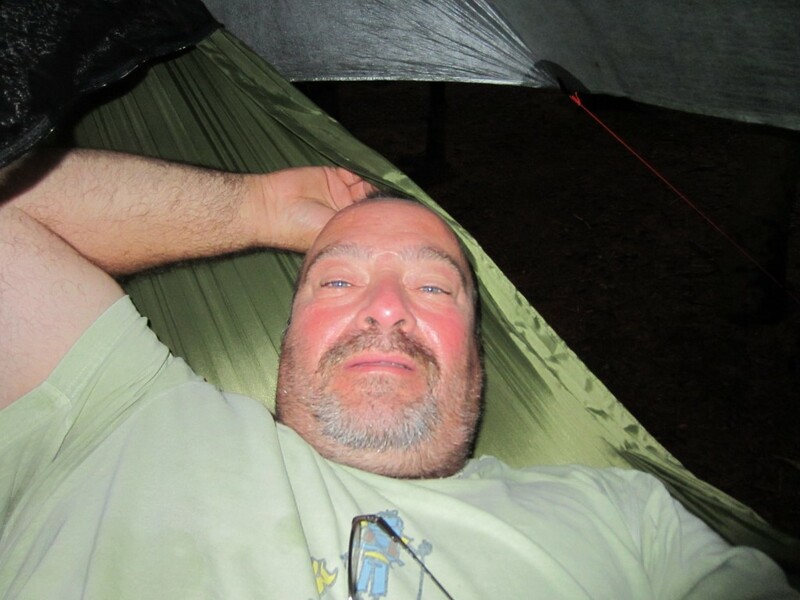 After dinner I was relaxing in my hammock when the next thing I knew I woke up and it was dark. I checked my watch – 9 pm. I could hear the guys talking and spied a campfire. By the time I got up to join them it was pitch black. What the heck! Apparently I had caught the last of the fire as everyone was hitting the hay. Oh well, back to bed. I guess I must have been tired as I slept until 7 am. After breakfast camp broke down rather quickly. I suppose we’re a pretty well oiled machine at this point.It’s not the breakdown that’s tough, it’s usually just getting moving that we struggle with. 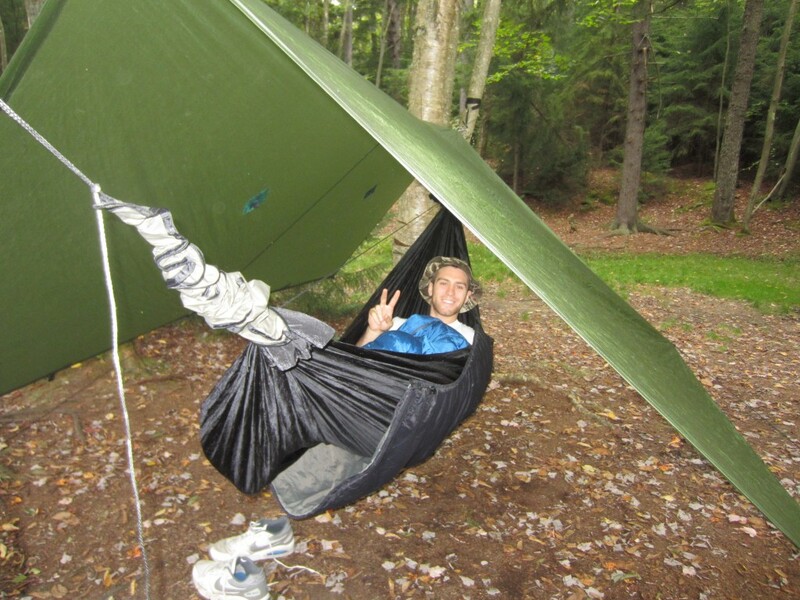 If you haven’t tried it and you’re the type to likes to get up early I warn you now, don’t buy a hammock. There is always a temptation to just lay there a little longer, and to steal a quote from Dave, “It’s glorious!”. As we prepared for our journey out Matt shared with us from Isaiah 55:1-9, “Come, everyone who thirsts,come to the waters; and he who has no money, come, buy and eat! Come, buy wine and milk without money and without price. Why do you spend your money for that which is not bread, and your labor for that which does not satisfy?………….For my thoughts are not your thoughts, neither are your ways my ways, declares the Lord. For as the heavens are higher than the earth, so are my ways higher than your ways and my thoughts than your thoughts.”. God wants us to be heavenly minded in all we do, to invest in “the bread of life” and “living waters”. These things were already bought at a price that we cannot afford through the blood of Jesus Christ. As always the hike out seems to fly by. As we crossed Red Creek we stopped for one last rest stop. It’s funny because that’s when most of us try to eat the last of our food because we want to walk out with nothing left. 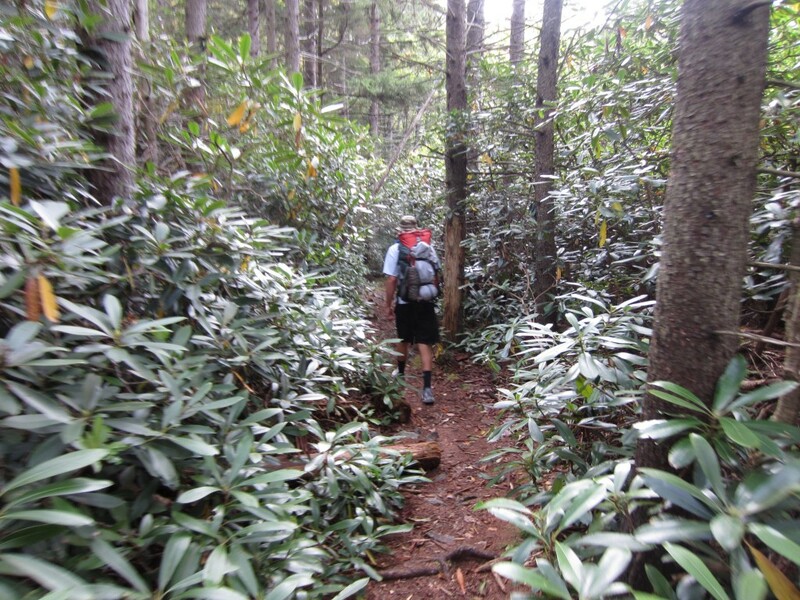 Like it matters if I get to the trail head with a pack of crackers in my food bag. It’s nice to be strange when no one is looking sometimes, I guess. 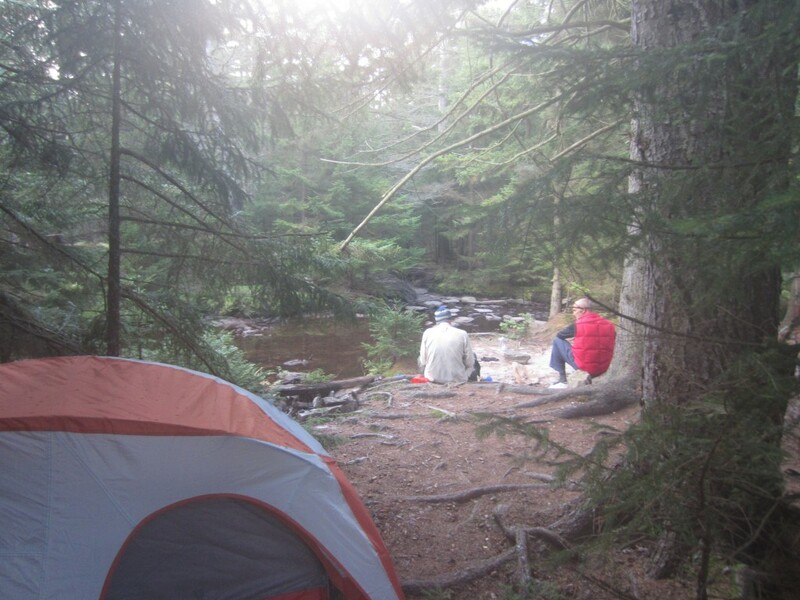 First of all, I guess I’d like to rate the campsites we’ve stayed at in the Dolly Sods Wilderness. We’re all in agreement so I can speak for the group. Number one by a mile is Three Forks. I can’t think of one bad thing to say about the spot – it’s a gem. 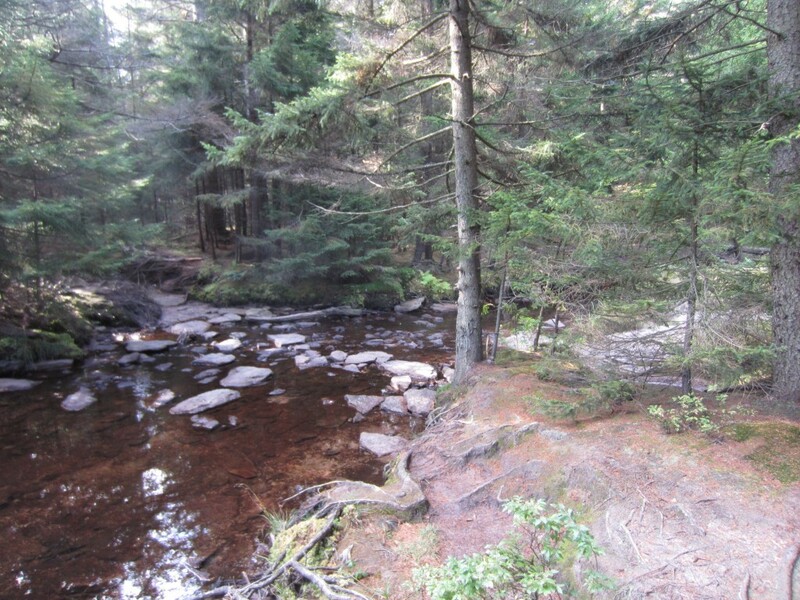 Number two would be along the Left Branch of Upper Red Creek where it crosses the Blackbird Knob Trail. Just an exceptional spot with the right amount of solitude. A distant third would be along Stonecoal Creek, and that’s only because I have yet to camp in the meadows of the upper ‘sods. I can picture a spectacular star show from the open plains and hope to one day experience it first hand. Which brings me to my impression of Dolly Sods after my second hike there. I’m certain that we will all be back here soon.There is so much diversity, just enough of a challenge, and the beauty of the area keeps my mind wandering back time and time again. 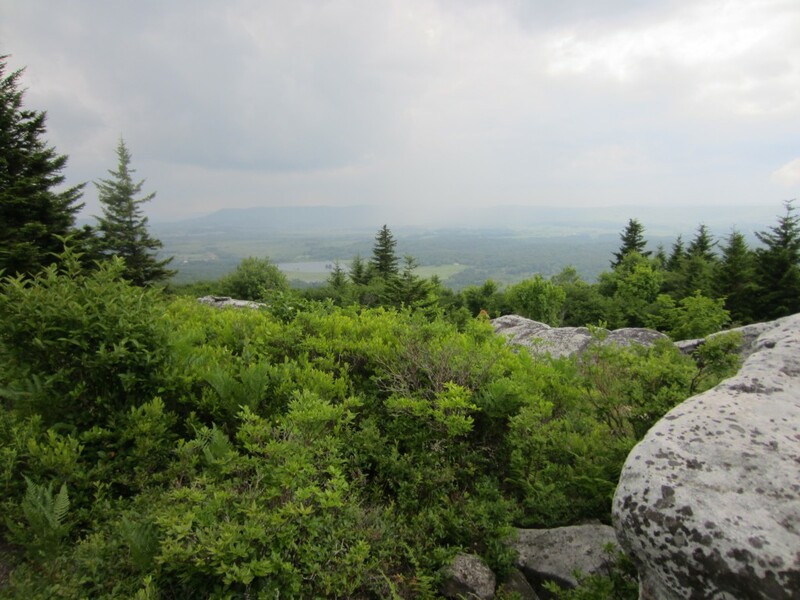 We have other adventures to pursue, but Dolly Sods will be on my short list for some time to come. PS: By the way, I’m still struggling with the idea of carrying extra gear on most trips, although a big fat juicy steak on occasion might just sway me! 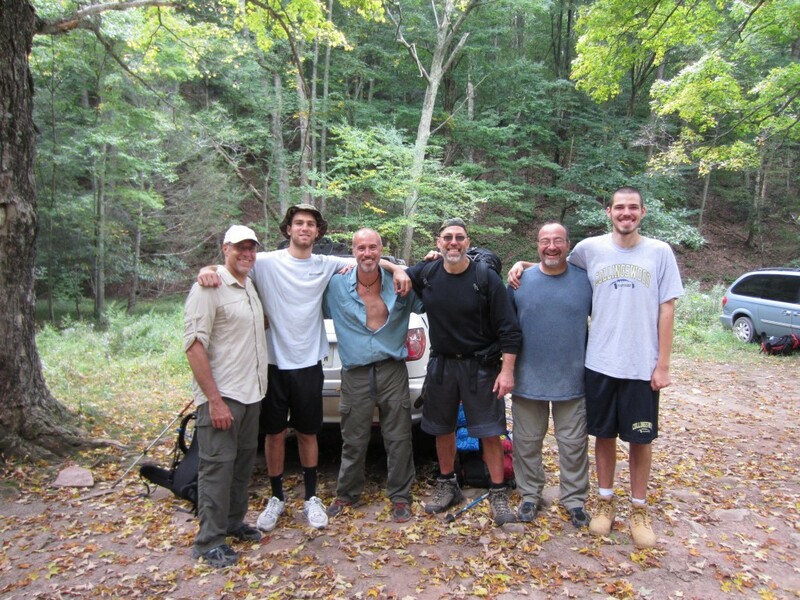 As a backpacker my to-do list of hikes is relatively short, but it never seems to get shorter as I complete each hike. Part of the reason is because as I explore new areas there always seems to be more options to explore. 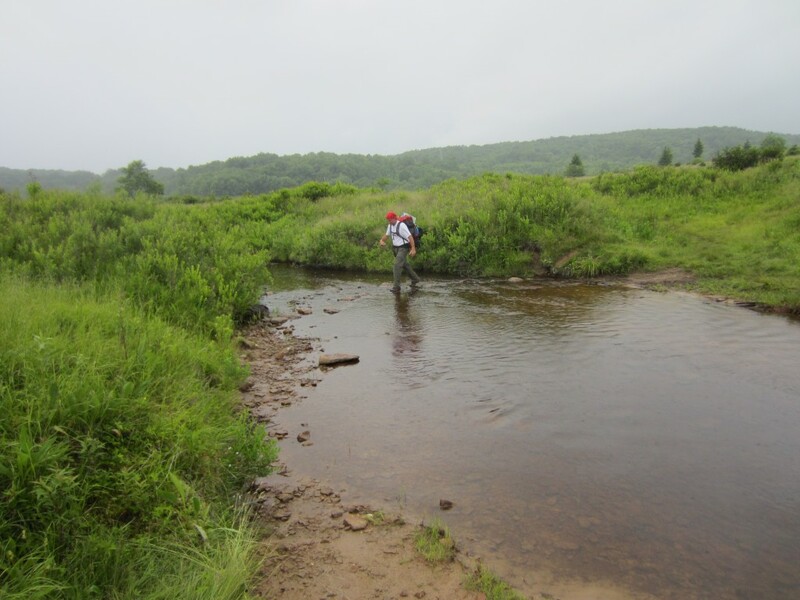 Well I’m here to tell you my short list just got a little longer after my June 28-29, 2014 visit to the Dolly Sods Wilderness in “almost heaven” West Virginia. 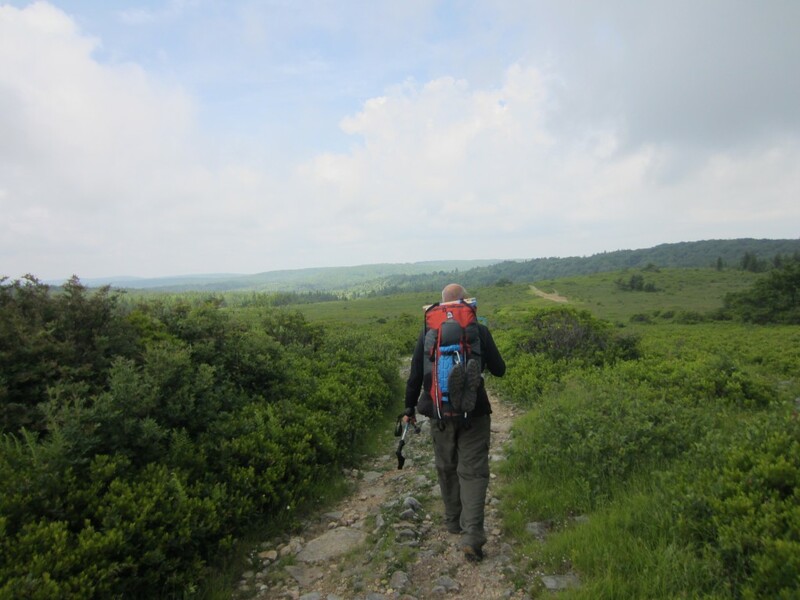 Joined by my brother (and not often enough hiking companion) Matt Bealor, we had the pleasure of exploring just a piece of the 17,371 acres that comprise the Dolly Sods Wilderness. Getting to the “Sods” was an adventure in itself (isn’t it that way on every trip?) 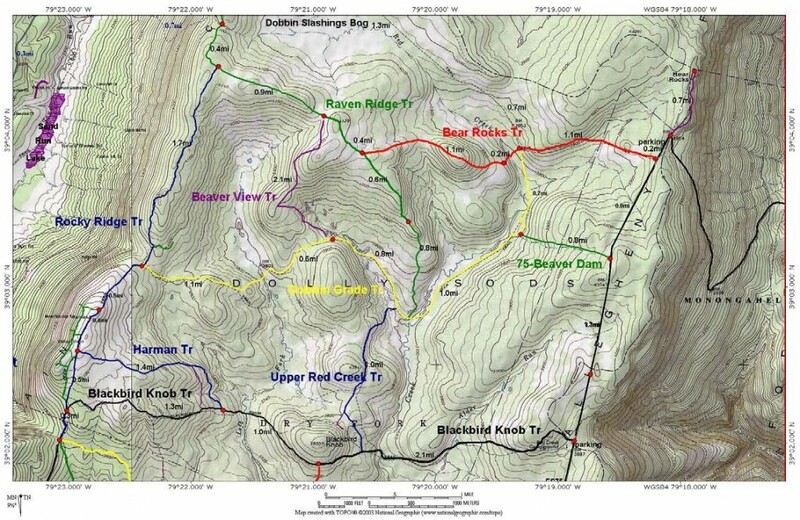 that entails a bit of “country” driving that eventual leads to a single lane gravel forest service road that winds and climbs for about 6 miles and 2000 feet before reaching the top of the plain, before connecting to another gravel road to access the various trail heads in Dolly Sods. No matter, the terrain and scenery were beautiful, and the pre-adventure excitement was building, until we finally reached our starting point – the Bear Rocks trail head. Apparently back in 1943 this area was used by the army for maneuvers and mountain training for WWII, and there was a bit of unexploded ordnance left behind. 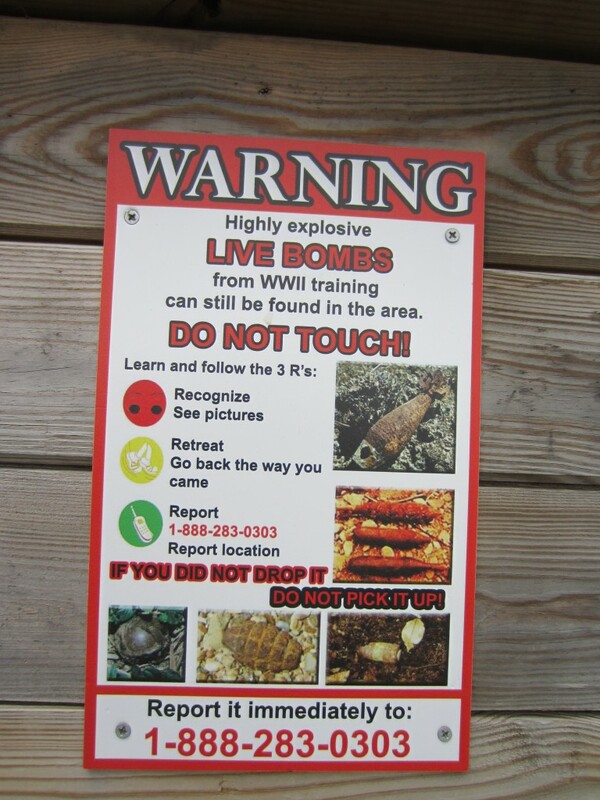 Much of it was cleaned up in 1997 at the most popular campsites, but there is still this warning, “IF YOU DID NOT DROP IT DO NOT PICK IT UP”. Me: “Hey Matt, is that your grenade under my hammock” Matt: ” Yeah man, sorry it must have slipped out of my pack, Can you pick it up for me?” Me: “Sorry man I didn’t drop it so I can’t pick it up” Yikes! 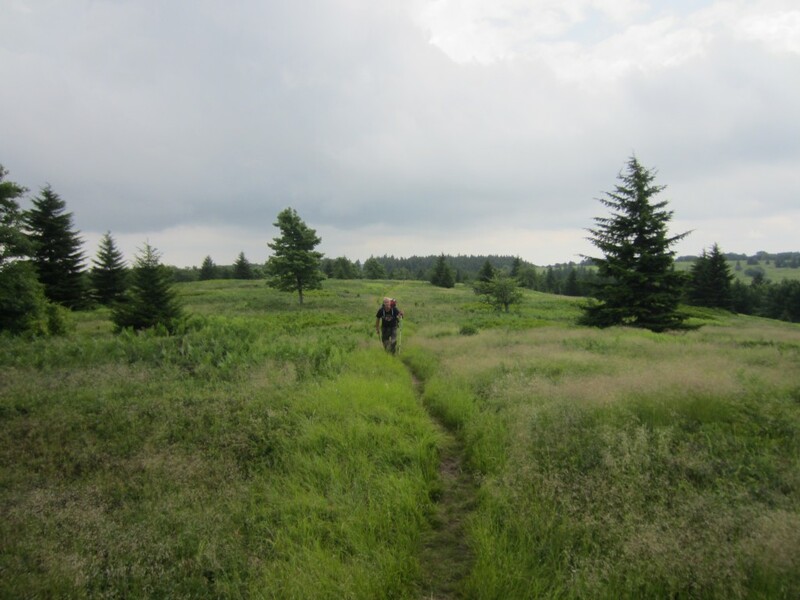 Trails in Dolly Sods have both a name and a number, but no blazes or other markings like those found on the AT for example, and I found that I rather liked it that way. None of the trails were difficult to follow, in my opinion, and all of the major junctions and trail heads were well marked. We started off on the Bear Rocks Trail (number 522), and right away knew this would be a different kind of hike. Typically most hikes here in the northeast are wooded with limited views, and that’s kind of what I expected here. Instead we started with rolling hills and open views, and that is what 80% of this hike would be. It was a genuine pleasure to be able to hike with my head up, looking around, instead of watching my feet. We started off on a gently meandering downhill path, and I hardly realized the path had as much slope as it did until the next day when we had to climb back to the trail head. We crossed the Dobbin Grade trail and reached a piece of trail where a boardwalk over a muddy section started in the middle of a mud hole! I was hoping this wasn’t a taste of things to come. This boardwalk was a little short! Just beyond the boardwalk we entered a short wooded section and our first crossing of Red Creek. Someone had made camp along its banks and I could hardly blame them. It was just a little too close to the trail head for my liking. The trail climbed gently through the forest, and just before we broke out into the open again Matt and I decided to take a lunch break. As we rested quite a few people passed us by. The one thing I did notice was that just about everyone we saw on day one were day hikers. In fact we only passed a few backpackers all weekend. One fellow on his way back to the trail head commented on how hot it was out in the open, but as we packed up from lunch some cloud cover rolled in. I was quite grateful since I hadn’t anticipated how exposed we would be, and was happy not to bake in the sun. In fact, between the clouds and the breeze it was a pleasant walk. 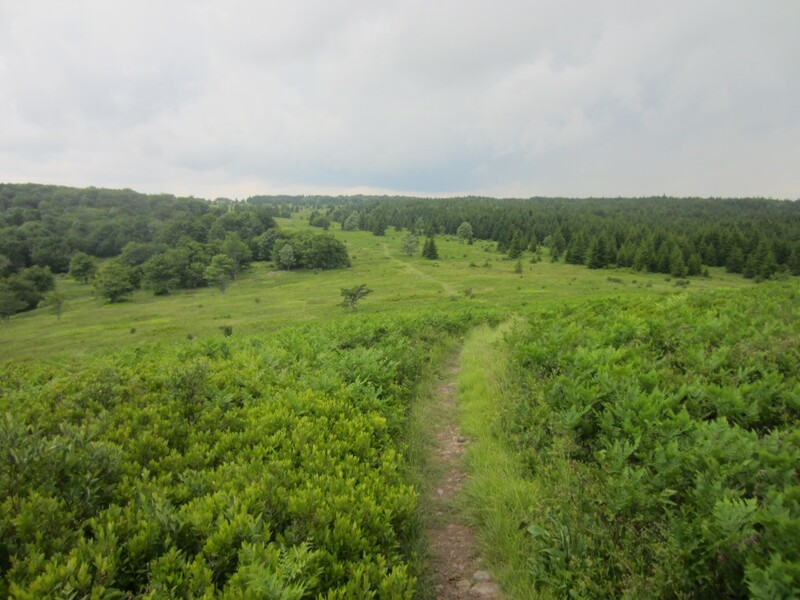 The trail meandered along open grasslands, interspersed with the occasional short wooded section, providing enough diversity to keep things interesting. Matt and I eventually came to the Raven Ridge Trail (521) and this trail just felt like an extension of the the first since the scenery stayed the same. 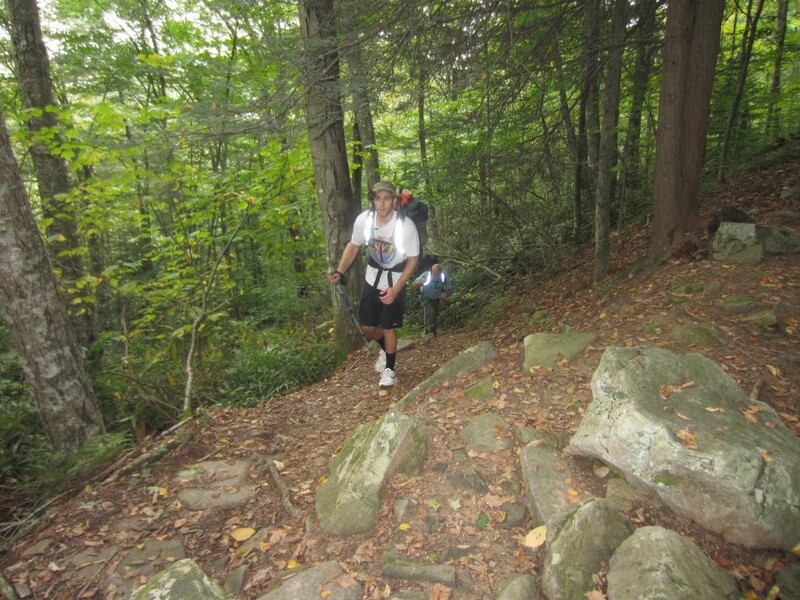 Once we hit the Rocky Ridge Trail (524) that would all change. The character of the trail became much more rocky (hence the name – just call me captain obvious) and as we hiked near the edge of the plateau the occasional view of the valley would open up. In the meantime you could look to the east and see the terrain you had covered over the past few miles. Throw in a little rain and things quickly got interesting as the rocks got more slippery. The rain slacked as we made the turn onto the Harman Trail (525), but either way our spirits couldn’t be dampened because we knew that with each step lower into the valley we were that much closer to camp. 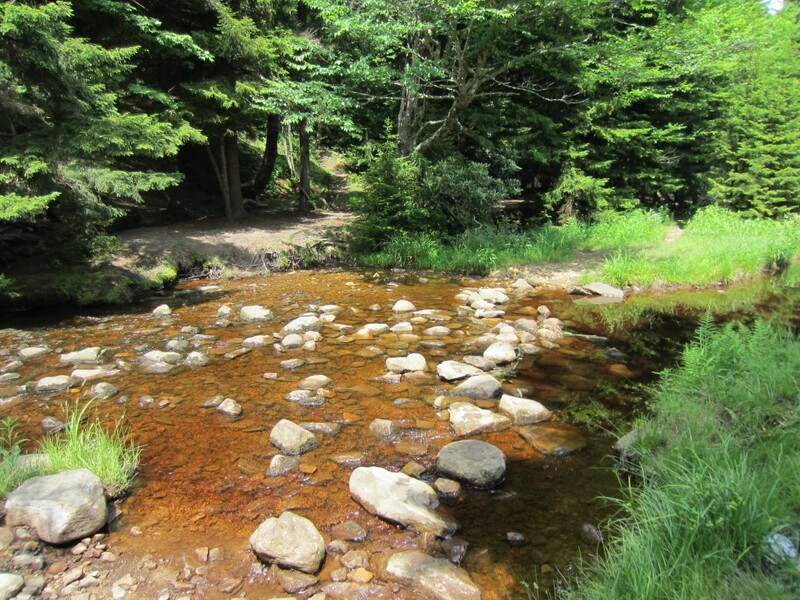 As we reached the Blackbird Knob Trail (511) our pace quickened and at last we reached Upper Red Creek. Someone had pitched a tent right off the junction of the trail and creek, but we were looking for more secluded digs. 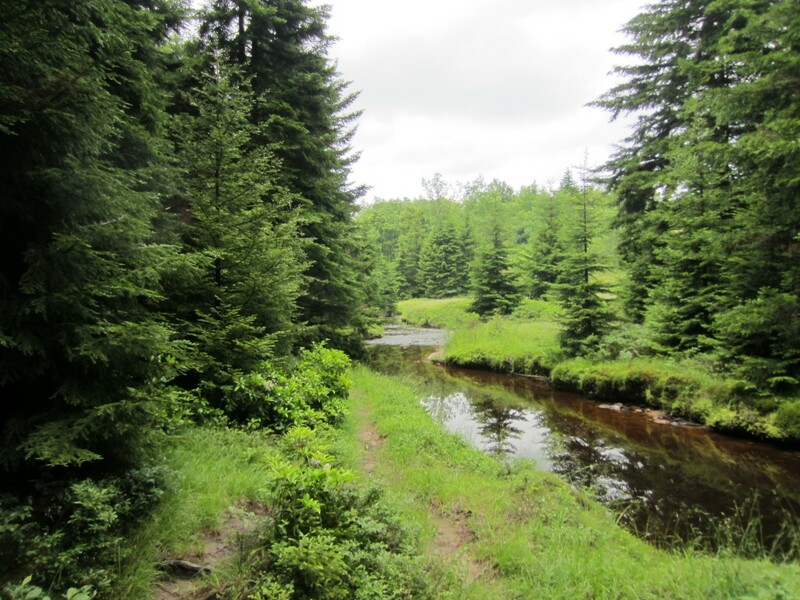 Just after you cross Upper Red Creek there is a trail to the left that follows the creek, and after a short 1/4 mile walk we were in a grove of red spruce that just begged for a couple of weary hammock hangers to call it home. 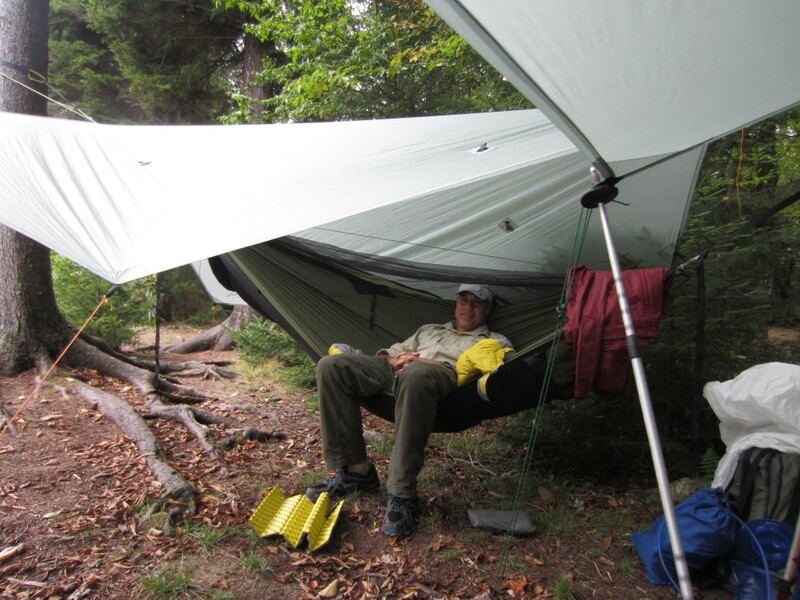 Unfortunately right about the time I hung my hammock it began to rain. 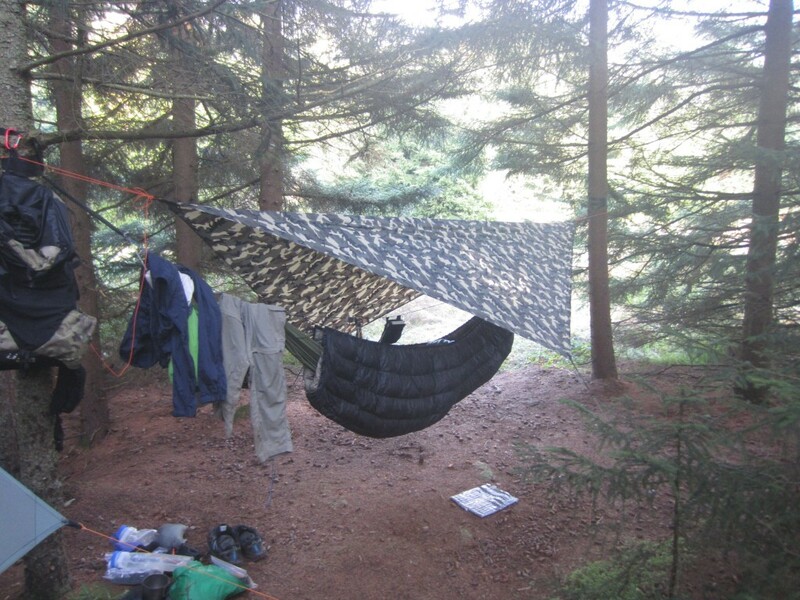 I hurriedly strung my tarp and dried my hammock before putting up my quilts. After helping Matt get setup I returned only to discover my trees were a little too close, and my ridge line was not taut. At that point I was more interested in getting out of the rain than looking for another hang so I decided to make do. It’s been a while since I’ve had to cook under cover, but it was a nice change of pace. I enjoyed my Mountain House Beef Patties and Mashed Potatoes dinner. Afterward, I decided to read, lounge, and generally call it a night. It was only 8 PM, and still light out, but I was bushed and it was raining. As I relaxed I could hear Matt up and about, working on a fire and staying busy. Even with a lousy setup I still slept very well. I guess it couldn’t have been that bad. I woke up about 5:45 and decided to make breakfast, figuring Matt would also be up soon. 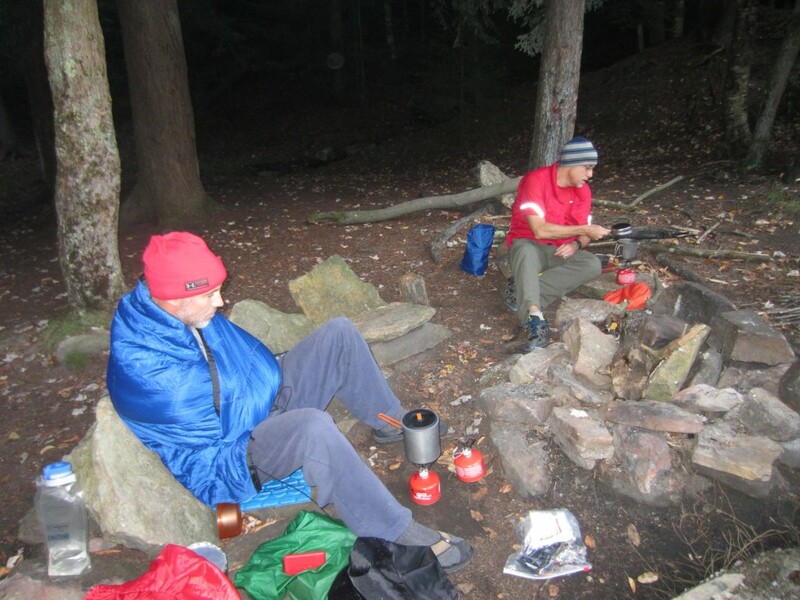 After retrieving my bear bag, cooking, and eating Matt still wasn’t stirring so I dozed off again, this time waking at 8:30. Thankfully this time Matt was up. On a whim I packed in a package of Jiffy Pop popcorn, and this became my second breakfast (no fire for me last night even though Matt succeeded in making one, and I wasn’t carrying uncooked food out). We took our good old time packing up and I believe we set a new record for latest time leaving camp at 11:00 AM! “O Lord, our Lord, how majestic is your name in all the earth! It’s mind blowing to think that the God of the universe would not only care to know my name (and yours), but also entrust me (us) as stewards over all of His creation. Very humbling indeed! 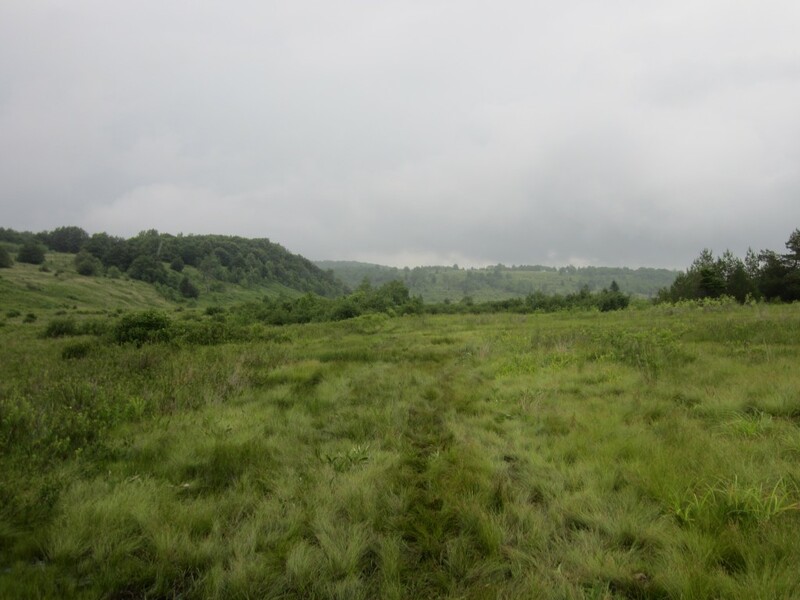 Once again we hiked under overcast skies, as we turned onto the Blackbird Knob Trail (511), this time in the direction of the Upper Red Creek Trail (509). After a bit of mixed hiking we reached an unmarked trail junction (odd, I thought), but I figured it was the 509 trail so we turned left. It turns out that was just a good guess, since a short distance later we came to the real trail junction. The Upper Red Creek Trail doesn’t actually follow a creek as you might presume, but rather crosses a low hill on it’s way to the next trail. After a quick snack and some easy hiking we reached the junction of the notorious Dobbin Grade Trail (526). This trail follows the route of an old railroad grade that hauled timber out of this region many years ago. That fact alone would make you think you were in for some solid, easy hiking. Not so. This section of the 526 trail is in a low valley (relatively speaking) so it is “famously” muddy. 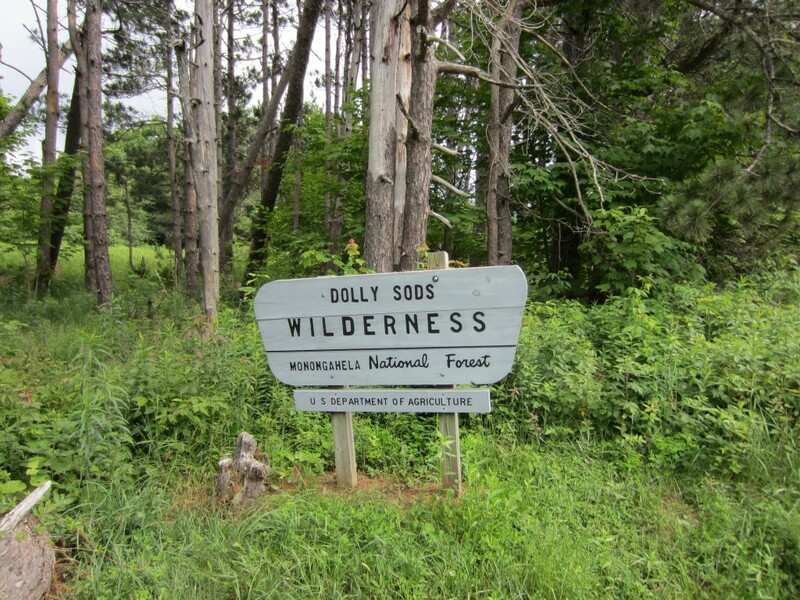 Read any trip report of the Dolly Sods Wilderness and you’ll know what I mean. After you cross Red Creek it becomes unbelievable soupy and boggy for probably about a mile. It’s a real mind game to not become annoyed, but if you just take the time to look up and look around, the views can change your attitude fast. Somewhere after passing the Beaver Dam Trail (520) the rain decided to get serious, at least serious enough to clean the mud from our shoes. By the time we made our final turn on the Bear Rocks Trail (522) the weather no longer mattered, as we were in “back to trail head” mode. There’s something about being in the home stretch that makes everything okay. We passed a fellow who was camped way too close to the road in my opinion, but other than that we only saw a couple of day hikers all day. What a trip! 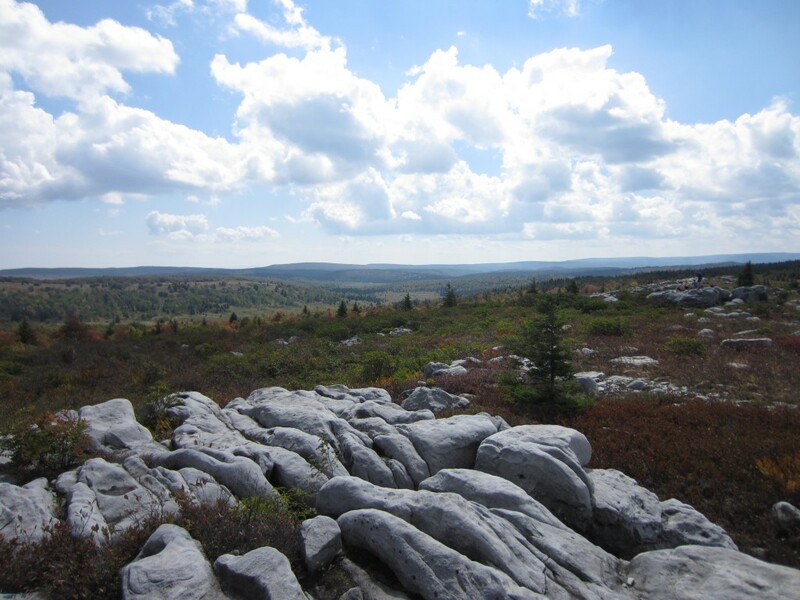 Dolly Sods lived up to everything I had hoped for and more. Views, beauty, some solitude – what more could I ask for? There is no doubt we will return again, and if I have my way it’ll be soon.